In a remarkable application of modern technology, scientists have created a device that can decode signals from the brain’s speech centers to produce speech through a synthesizer. Case Western Reserve University researchers and partners, including a collaborator at Cleveland Clinic, are pushing the boundaries of how "smart" diagnostic-imaging machines identify cancers--and uncovering clues outside the tumor to tell whether a patient will respond well to chemotherapy. 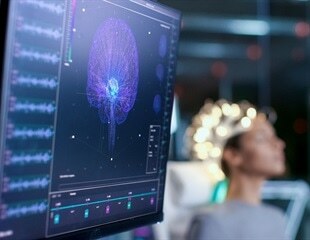 Scientists used brain signals recorded from epilepsy patients to program a computer to mimic natural speech--an advancement that could one day have a profound effect on the ability of certain patients to communicate. In a series of studies that volleyed between large databases and research in zebrafish, Vanderbilt investigators have discovered a link between vascular biology and eye disease. Ovarian cancer is usually diagnosed only after it has reached an advanced stage, with many tumors spread throughout the abdomen. University of Texas at Dallas scientists have demonstrated that the growth rate of the majority of lung cancer cells relates directly to the availability of a crucial oxygen-metabolizing molecule. Researchers can now see how the two sides of the living brain mirror each other thanks to a new combination-imaging technique. In a breakthrough study published today in Nature Medicine, researchers at Joslin Diabetes Center have identified a group of 17 circulating inflammatory proteins that are consistently associated with the development and progression of diabetic kidney disease. A research team at Massachusetts Eye and Ear has shown that microglia, the primary immune cells of the central nervous system--including the retina of the eye--serve as "gatekeepers," or biosensors and facilitators, of neuroinflammation in a preclinical model of autoimmune uveitis. Many individuals forced to fight an exceptionally aggressive form of the blood cancer acute myeloid leukemia (AML) don't survive more than five years. Astronauts on long missions at the International Space Station can experience changes to their eyes and vision that can last for years. A scientific breakthrough provides new hope for millions of people living with multiple sclerosis. Researchers at Oregon Health & Science University have developed a compound that stimulates repair of the protective sheath that covers nerve cells in the brain and spinal cord. Synthetic biologists have added high-precision analog-to-digital signal processing to the genetic circuitry of living cells. Extracts from the seeds of the Ginkgo biloba tree show antibacterial activity on pathogens that can cause skin infections such as acne, psoriasis, dermatitis and eczema, a study at Emory University finds. A new study led by a research team from Massachusetts Eye and Ear and Harvard Medical School describes how bacteria adapted to the modern hospital environment and repeatedly cause antibiotic-resistant bloodstream infections. Researchers have identified a pattern of brain activity that predicts anger experienced during dreaming, according to a new study of healthy adults published in JNeurosci. Some nights are filled with happy dreams while other nights may be all about angry dreams. Researchers have found certain clues in the brain waves that show the reason why angry dreams occur when a person sleeps. Amyotrophic lateral sclerosis is an incurable disease of the central nervous system. In most cases, ALS is fatal within a short period following diagnosis. Researchers at Rutgers University have revealed that pre-schoolers in New Jersey have the highest rates of autism ever recorded in the US.